The interesting thing about this photo of 2 native women and child packing stuff in 1897 at Dyea is the shape of the canoe which is very traditional, yet this one is not that decorative. It one of the few photos of Tlingit children and women at work. I have never heard of Rock Point Bridge on the Chilkoot Trail, it may be up near Finnegans. During the winter of 1897 these goldrushers were using sleds to transport their stuff up the Chilkoot Trail. The photo is dated December 10, 1897. Yesterday I attended a lecture at the National Park Service by M.J. Kirchhoff on violence on the trails and the Soapy story. There was also a critical review of Spude’s book which many agreed had many false assumptions and mistakes. Mark agreed that Jeff Smith’s book on Soapy is a very good reference for students and historians. I was also very flattered that he twice referred to this blog and my research! Wow, I feel a little light headed here! There was some interest in numbers of deaths during the 1897-1899 period from various causes, so I will compile that data later today and do a review on that too. Arthur was the eighth child born to the Richards family in 1859 in Ohio. His older sister, Clara ran the post office in Dyea, a story which I wrote about earlier here. Apparently her two brothers were also here, Arthur and Daniel. One descendent said that family lore has it that Arthur was responsible for laying the first telephone line from Dyea to the top of the Chilcoot Pass. That would have been during the 1897-98 time as there were several tramways built at that time also. They had better communication then than now, even cell phones don’t always work on the trail today. 1900 census; Daily Alaskan 3/13/1900 (in 2001 Skagway News); Skagway Museum record; CA death rec; Photo and letter courtesy of Diane Richards Design. Information and updates courtesy of Glenn McKinney – many thanks! Although I have absolutely no record of either Holman or Nurnberg having a store in Dyea, this is how the photo was labeled that sold on ebay recently for $300. If you can blow up the photo note the odd decorations on the sign at the top corners. There was a Native Cemetery in Dyea which was different from the Slide Cemetery. 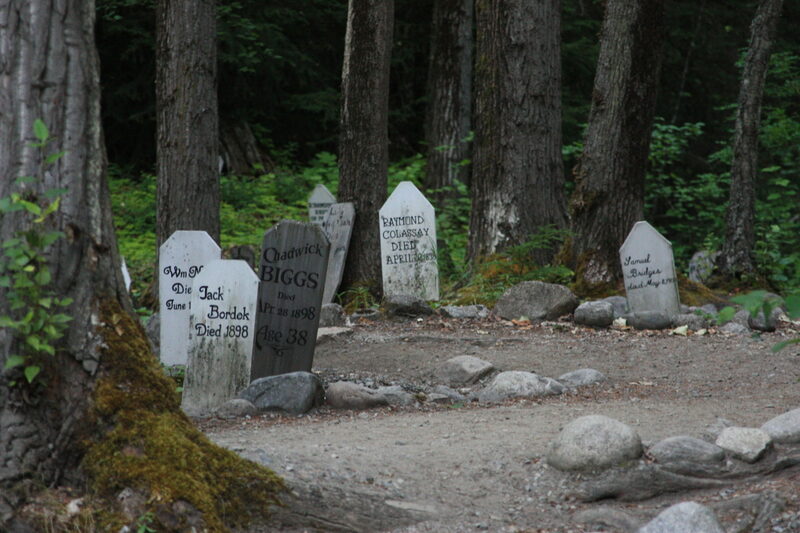 In the 1970’s, I believe, the cemetery started to wash into the river, so some of the graves were moved over to the area near the Slide Cemetery. The house pictured above must have washed away. The photo must have been taken prior to the October 1898 issue of Munsey’s where it appeared. I do not know who the man pictured was. Though I do not know the owner of the Glacier Hotel in Dyea, here is a nice picture of it, with lots of stuff in the foreground.